If bike culture is like music, the fringe-loving bikers who joust on their tall bikes are like the folks who refuse to see any band that plays a venue that’s legal and holds more than 200 people. 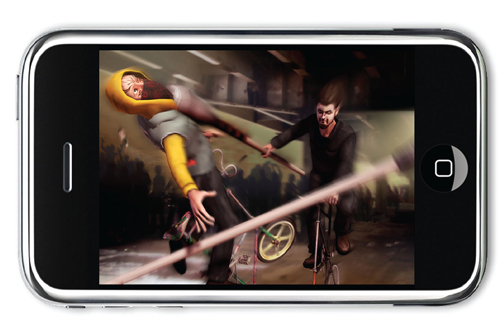 To the horror of some members of the punker-than-thou tall bike clique, bike jousting is soon to make it to the very small screen in the form of an iPhone video game app named Tall Bike Joust. It will be released on New Year’s Day. Although there aren’t a lot of details about the game, if the trailer is any indication, it should be a good one. Featuring chaotic clips from the B.I.K.E documentary, the soundtrack to the advertisement/preview is by the Brooklyn duo Matt & Kim, a band who is ridiculously cool, fun and inclusive. And those three qualities are something bike culture would do well to aspire to, tall bikes, jousts or not.